Running outdoors in warm to hot weather is one of the best times for a guy to be shirtless (aside from swimming). Why? First of all, it just feels great. It's much cooler and more comfortable without a shirt and the sun feels nice on bare skin. It's also pretty widely accepted most places. A lot of guys go running shirtless. It's expected. Sure, there are always some jerks out there, but for the most part the world's a pretty nice place for a shirtless runner. When that one jerk yells, "Put a freakin shirt on! ", just remember the last five people who smiled, waved, or nodded their head and let it roll right off your bare back. And humbly accept any cat-calls as a complement and keep on truckin. I think most serious runners train shirtless in warm weather, so you'll be in good company. And running is great exercise. If you aren't doing it already, you should consider taking it up. And I mean really running, if you aren't running hard enough to feel the need to take off your shirt when you run (breaking a sweat, getting hot) you should try to step up the intensity. Of course, everyone has to start somewhere and if all you can do is walk or jog lightly at first, then by all means do it. But the goal is train progressively more intensively. And that can be an added motivator for guys who are shy about taking their shirts off. Run hard enough that the sticky sweat and humidity under your shirt makes you desperate to peel it off. Go ahead. You've earned it. Not that going shirtless is something you have to earn, but if anybody has earned it, the serious runner has. So, what do you do if you are shy about taking your shirt off? Well, start off by making it a little easier on yourself. Are there particular people you are uneasy about bumping into? Plan to go jogging at a time and place you are unlikely to see them. Maybe you want to pick some place where you won't see many people you know, or many people at all. You can start out running with your shirt on and peel it off when you get hot and sweaty. Maybe you can find a friend who will run shirtless with you. That kind of moral support can be a big help. Maybe you know someone who runs shirtless, or perhaps there is someone you are close enough to that you can ask him. Gradually, you wil l want to expand your comfort zone. Unfortunately, that means encroaching on your uncomfortable zone. But your new-found freedom will be worth it. Join the ranks of the shirtless runners, you'll enjoy it too! It's not about being narcissistic and showing off your body. It's not about having the perfect body. It's just about being comfortable in your own skin. So don't worry too much about what other people think. And if anybody out there reading this used to think all of those shirtless runners they saw where just showing off, I hope this will enlighten you. There are a lot of reasons guys choose to go without their tops, don't presume to know what someone is thinking. It can, however, be an encouragement if you don't have quite the body you would like to. When you run shirtless, there is no more hiding. Let it motivate you to build the body you desire. And I don't mean what you think somebody else thinks you should look like. Do it for you. And when you get there, don't feel like taking your shirt off is vain. Have a healthy sense of pride about your accomplishment and your body, but don't let it go to your head. Encourage others to follow the path you have taken. 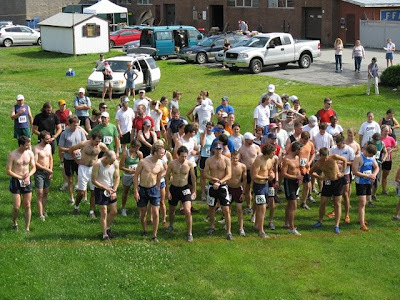 Maybe one day, you'll want to run in competition races or charity events. Maybe that's not for you, but you can always enjoy a good shirtless run. I hope you will give it a shot. 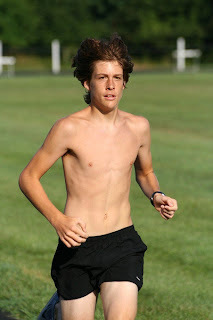 Also, check out the great blog, Running Shirtless. It's one of the things that inspired me to start this one. Another one was this facebook group* where a cross-country team was protesting a new rule forbidding shirtless running. That helped convince me there was actually enough opposition to be worth writing this blog. Another XC team in a similar position has started their own protest group. Feel free to drop by to show your support, or write to the schools advocating a more relaxed policy. * Pardon the language, I didn't create the group. Note how all of the shirtless guys are in the front. For those who don't know, faster runners position themselves toward the front and slower runners further back so the faster runners don't have to pass so many slower runners. It just makes everything work a little smoother that way. I like your observation that "When you run shirtless, there is no more hiding". You are so right to urge that going shirtless should be seen as an encouragement to 'better one's body' rather than cited as an activity necessarily forgone due to a little flabbiness here and there. I struggled with this for years. Then after one year of doing MMA workouts because I wanted to be in good enough shape to go running without a shirt, I decided to take up running without a shirt. I will only run now without a shirt and I love it.